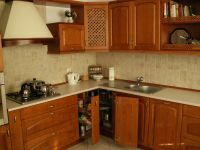 Our goal is to create the inside of a kitchen in such a way that time spent there is full of creativity while preparing the dishes and full of reflection while eating. 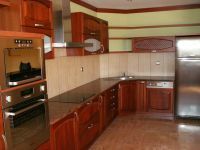 Each kitchen is a deliberate project that has functional furniture with proper equipment of companies like BOSH, SIEMENS, AMICA, CANDY, ELECTROLUX, GORENJE, MIELE, HAIER etc. 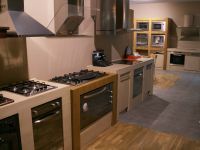 In production of our furniture we can offer a variety of fronts made of MFC (melamine faced chipboard), MDF - which can be high gloss or matt lacquered, natural veneers, aluminum frames with glass (safe, artistic, traditional etc) inside or solid wood. 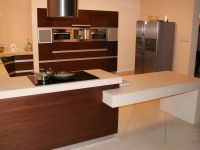 As for table-tops we use 28 and 38 worktops with oval post-formed edges, covered with 0,7 and 0,8 mm HPL laminate which is special for its high mechanical damages durability and thermo-resistance. 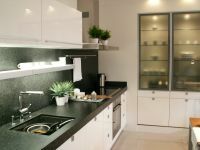 In our production we also use other materials like bended glass, aluminum, steel, acid-resistant steel, conglomerates like CORIAN, RAUSOLID or POLIGRANITES used also as worktops. 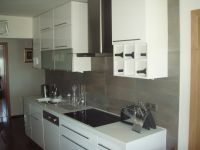 We use hinges produced by Blum which is well-known company famous for life-long warranty for its products. As additional equipment - wired baskets, cargo, lighting we use accessories of such renowned companies like Gamet, Nomet, Peka, Rejs and other. 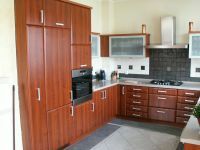 We equip our kitchen cabinets in accordance with the client’s needs. We can provide the drawers with the METABOX system or the TANDEMBOX system by Blum with self closing system and full range opening. 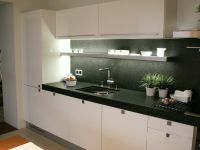 MAGIC CORNER system by Blum may be very useful and handy for people using the kitchen. 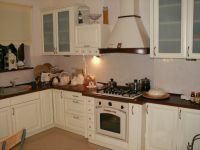 We can offer flexibility and creativity in supplying the kitchen furniture with different equipment.